Certain things, I cannot accept. Like Exxon Mobil’s sponsorship of CNN’s inauguration coverage. I am sure, if Barack Obama had a say, he would not tolerate having his name associated with one of the worst contributors to climate change. Please join me in boycotting CNN and turn to other sources of coverage instead. Sarah Palin should not have mocked Barack Obama for being a community organizer. If anything, tonight’s results proved her wrong. Our new President has given new meaning, and strength to the concept of community organizing. And he has shown us what citizens can do, when given the means to organize towards a cause, that’s greater than themselves. Tonight I am thinking of the thousands of Obama offices, volunteer networks, and fundraising organizations, along with the sophisticated Internet machine, and the organizing methodology, that went into getting Barack Obama elected. As the signs are coming down, the thank you emails go out, and the temporary offices go back to their original owners, I wonder, is that it? Will we go back to business as usual, each in our homes, going about our private lives? Or will we use the skills learned during the Obama campaign to mount a national community effort, this time to address the threat of climate change? The last time I checked, we had less than ten years to get our act together. Citizens have a crucial role to play on the conservation end. As someone who has tried for the last year and a half, to curtail my consumerist and energy appetites, I can testify on the difficulty of accomplishing such changes at the individual level. Instead, we need to summon the power of community to help each other. Tomorrow, after you have come down from your victory high, I urge you to keep alive the citizen spirit that made you pick up the phone, and knock on doors, and put up signs on your lawn. Take that energy and become an organizing force in your community. 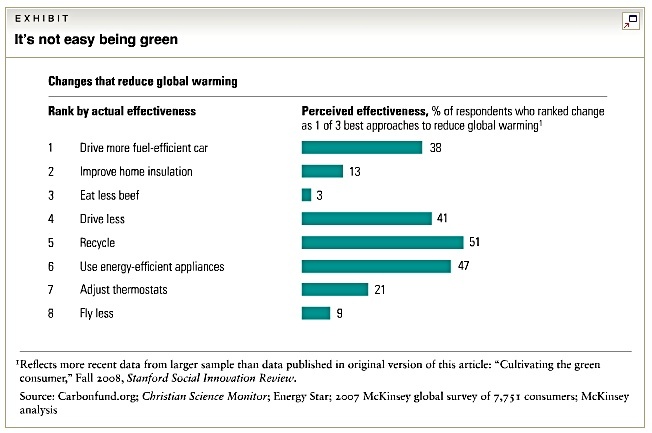 Start a No Beef Lunch at your kids’ school, or a telecommuting initiative at work, or a volunteer home insulation project in your city . . . The climate cause may not have a face like Barack Obama, but it’s all the more reason to take it on. This is a refrain that comes up a lot, including from some La Marguerite readers. I say, this is a false debate. The answer is, we need both a competent leader, and responsible citizens. A new President who understands and places sustainability, climate change solutions, and energy independence on top of the national agenda. Citizens who believe in their power to make a difference, in their support of new environmental policies, and in their daily lives. One without the others won’t work, and vice versa. The last few years should be proof enough. 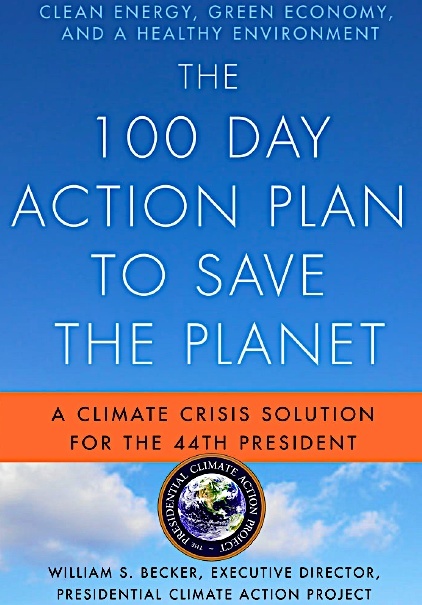 I just got a peak at William Becker‘s new book, ‘The 100 Day Action Plan to Save the Planet – A Climate Crisis Solution for the 44th President‘. Finding the new driver of our economy is going to be critical. There is no better potential driver that pervades all aspects of our economy than a new energy economy … That’s going to be my No. 1 priority when I get into office, assuming obviously that we have done enough to just stabilize the immediate economic situation. We’ve got a boat with a lot of leaks, and we need to get it into port. That’s what the financial rescue package is about. But once we get it into port, once the credit markets are functioning effectively, then it’s time for us to go back to the fundamentals of this economy. The big question of course is, how long before we get ‘it’ into port? Nature has been patient enough, and it cannot wait much longer, for us to take remedial actions. Last, kudos to Martin’s Press for deciding to publish William Becker‘s book, electronically. That’s what I call walking the writing! You can order the book here.